Maurizio Sarri questioned his ability to motivate Chelsea’s spluttering stars after their humiliating 4-0 defeat at Bournemouth on Wednesday. The shocking result at Dean Court ranked as Chelsea’s biggest league defeat for 22 years and was their fifth loss in the last 12 Premier League games. The Blues have dropped out of the top four — below Arsenal on goals scored — to leave their bid to qualify for the Champions League under severe threat. 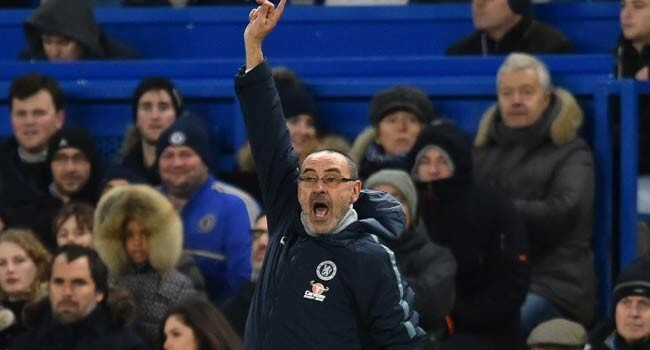 And Chelsea boss Sarri, who publicly questioned his side’s approach after the recent defeat at Arsenal, conducted a lengthy post-match inquest alone with his players after asking his backroom staff to leave the dressing room. The Italian maintained he does not feel under pressure but admitted the blame for the defeat could lie with himself. “In that moment I wanted to talk with them alone, without anybody else,” he said. “I needed to understand. It’s impossible to play in such a different way between the first and second half. “I don’t understand why. I don’t know exactly. I want to try again tomorrow because we want to solve the problem. “I think (the players are good enough). Maybe we are not at the top of the Premier League at the moment, but we are competitive. “We cannot lose 4-0 against Bournemouth. I want to respect Bournemouth, but it’s impossible to lose 4-0 here.